I have asked Elizabeth to write about her third trip down the Camino- This is her first post about Camino Tres. In late spring I felt the Camino calling me back for a third round, and once I hit Spanish soil two months later, there was no turning back. And that is when things fell apart. My two other treks had begun in June, but this time I began my Camino in July. Unbeknownst to me, this meant I was in a jam even before I got to the trail. During my last Camino in 2009, I arrived in Madrid with my sights set on St Jean Pied de Port, the small French town that is the Camino headwater just over the Spanish border. And in 2009, the trail gods were with me. A high speed train took me to Pamplona and a taxi took me from there to St Jean Pied de Port. This time the story was filled with a looming specter that I had underestimated: the Running of the Bulls in Pamplona. The Running of the Bulls made me a beginner again. The trains from Madrid to Pamplona were full with no tickets available. Madrid was buzzing with people all bent on going to Pamplona for the festivities, and I had no backup plan. Iâ€™d done this twice before, how could I feel like such a novice? How could I still be stumbling around like this was my first rodeo? One metro ride, three lurching, lumbering slow trains and a taxi ride later I was in Pamplona but not yet to St Jean and the beginning of my journey. I haggled a posse of Americans from the train into letting me sleep on their floor, but somewhere to pass the dark hours was all I really got. Pamplona was alive all night, and herds of drunken revelers traipsed over me like rush hour traffic. I curled my back to the wall and wondered what rabbit hole I had fallen down. Morning came and my taxi ride out of sunny Pamplona took me towards that familiar French town of St Jean and the starting gate I knew so well. As I left the old city of Pamplona, the streets were empty and the sun was creeping into all the dark corners of night soaked revelry. I sighed with relief to leave that trouble behind. But a turn north proved more worrying. The Pyrenees were dark, not dark like night or even creeping dawn, but dark like weather, like soaked clouds of doom hanging around long after the sun had risen. There was no doubt about it. There were rainstorms in the mountains, and I had no protection against such a foe. Back in the states, in a moment of temporary insanity, I had left my rain jacket at home. To be fair, it was 95 degrees as I meticulously packed my small cache of clothing into my pack, and my brotherâ€™s haunting notes about his Camino in July had send heat shivers across my skin. He said that nary a drop of rain fell in the 30 days he spent on the trail. The sun had been his ruthless companion, seeking him out with dehydration and sunburn in every waking moment. Being a New Englander by birth, I was a bit fearful of weather so hot that it crippled oneâ€™s ability to walk, because my primary job would once again be walking. So the rain jacket was forgotten. Better to carry a tube of sunscreen. In other places, rain is annoying, but in the Pyrenees it feels dangerous, like an enemy suddenly lurking in the misty land ahead, one you canâ€™t really play off as innocuous. I felt armor-less. Even a pathetic non-rainproof rain jacket like the one from my first Camino would have been welcome. At least I could have appeared to have a line of defense. My taxi driver turned down the American rock music and pointed out the obvious fact that it was raining in the mountains. Then he asked me if I had good gear for â€œvery bad and unpredictable weather.â€ I nodded mutely and felt my pulse rising. I was unprepared. With over 1000 Camino miles under my belt, I was a beginner again. After running around St. Jean Pied de Port like a crazy person in search of rain gear, I was at the edge of town covered in plastic. My backpack cover was (thankfully) in place so all the contents of my bag would be dry no matter what. My body though was still adjusting to the sheet of thick blue plastic curled around my torso, flaring out to my elbows in wide sleeves and spilling out to my knees like some open flap skirt. I now owned a poncho and needed to wear it too. Call it revenge for all my disparaging remarks in ‘The Trail’ in regards to this article of clothing. I was now officially eating crow. Iâ€™d become my own object of mockery. The rain enjoyed my costume and felt pleased enough to halt its deluge for a few hours. The sun even peeked its head around the distant peeks. I shoved the blue creature into my bag like a dirty secret and darted up the mountain for the first short day of walking to Orrison, the farthest I could go after my late start. I hoped the universe had laughed enough at me and my poncho and I would not be forced to wear it again. But I was a beginner again, and it seemed I was a bit of an unlucky one too. The next morning dawned and after two Caminos of beautiful mountain crossings, I was greeted with walls of white and the smug sting of more rain. Not only would I have to wear my new poncho, but I would be caught in a tunnel of white for the rest of the day. Also my new shoes were doomed (because whatâ€™s the point of paying for the gorex waterproof kind right? Silly for July in Spain- extravagant even!). That afternoon, when I arrived in Roncesvalles on the far side of the mountains, I was startled to once again be a newbie. The old monastery building that had housed pilgrims for as long as anyone could remember and had cradled me twice was closed. There was a new albergue, the Spanish word for pilgrim hostel, and it was as modern as they come. Impersonal cell blocks of bunks ringed each floor and the spaces for gathering were harshly lit and cavernous. This was new and jarring. Would there be anything familiar about this familiar journey? In the days to come I would find the trail a place changed. Sometimes for the better as in the new influx of families walking the trail with their children. In the past, I had seen only a single child under the age of fourteen, and the one I had met looked bored and lonely in a world of adults. But with the change of season to the month of July, I was suddenly waiting for the sink behind a five year old on tippy toes and watching fathers lope by with baby carriers instead of backpacks. I even crossed paths with a family walking from France who had brought a donkey along with their three children, one of whom was not old enough to walk let alone amble down the trail. Many people I met talked about the joyful feeling of traveling alongside little pilgrims in warm family herds as well as the admiration they had for the pregnant woman walking the trail in her second trimester. The Camino was suddenly blooming with life, and it was bliss to sit down at the end of the day and let it flow around me. I was happy to welcome such a sweet thread to the trail, happy to be a beginner with such pilgrims by my side. One of my most beloved companions deep in the journey was nine-year-old Martin who had been walking the trail in sections since he was six. 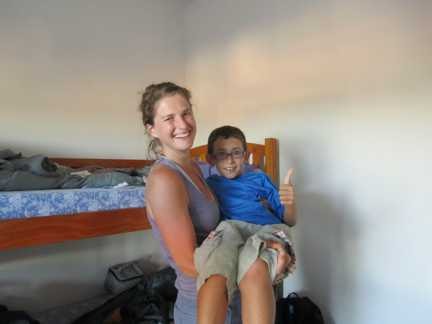 He was more of a veteran than me but still willing to camp out on the floor by my bunk and help me practice my Spanish. Next year, he will go all the way to Santiago, and something tells me his time as a pilgrim has only begun. But there were other currents of change and signs of unsettling shifts. These elements made me feel clumsy and distant from a trail I felt I knew so well. It was like returning to an old friend to find her changed in way that make her feel very, very far away. 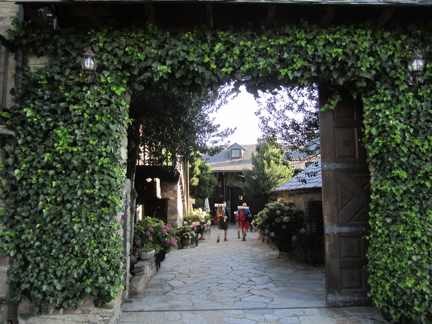 I was a beginner as I navigated the chaos of San Fermin and the Running of the Bulls in Pamplona, because even after traveling through it to get to the trailhead, I had to return to walk her streets three days later. I had always been at the far end of the trail, nearly five hundred miles away from the festival when it spilled its sticky, smelly, chaotic, dark energy all over the Camino. I would only see clips of the running on the TVs in bars, never seeing what lay beyond the two minute run of the bulls down the main street of the city. I was horrified enough, but the things that the cameras didnâ€™t show were so much worse. There was death in the arenas and drunkenness in the middle of the morning, trash and unconscious people littering the streets, parks and church steps. Not a single surface was spared, not even the ancient trail. This time I would walk through Pamplona during the second day of the festival and the pain I felt for the Camino was acute. I had been so naÃ¯ve. I was humbled to realize that the Camino had to endure this barage of darkness every year. I wondered if the ripple of toxic energy could be felt down the length the trail, like a living spine. And I was a beginner in my own smaller realm. I had already betrayed the weakness in my packing skills but there were other cracks that showed how new this particular Camino was for me. Connecting to others, buying food, washing my clothes, packing my bag, waking up before dawn. All these elements felt strangely foreign. How could this be? I spent several days feeling dejected and unsettled by this strange new dance I was engaged in with the Camino. Where was that old familiar feeling? And then I realized where the disconnect had begun. Iâ€™d thought I could pick up where I left off. I thought I could skip the introductions and just go back to being familiar. No need for a handshake or polite questions, Iâ€™d wanted to take off my shoes and curl up in the Caminoâ€™s arms like old times. 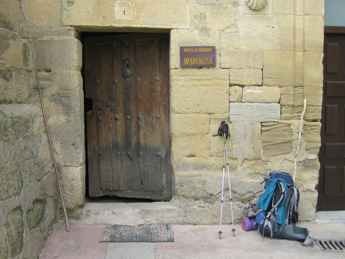 My last contact with the Camino was in Santiago after five hundred and fifty miles, and it had felt great. I was strong and familiar with the trail beneath my feet. We were close, closer than close. I had wanted to pick up the thread where I left off two years ago, but this was not the way the Camino or any living relationship works. Now I was at the beginning again. There were awkward pauses and stilted attempts to connect. No way around it. I had to earn our closeness again. I had to listen. I needed to be present to the present, rather than caught up in the past. I spoke with several other Camino regulars (it is surprising how many return again and again to the trail), and we all agreed we felt a bit like people waiting to get our sea legs or waiting for a love one to recover from amnesia and embrace us again. We all remembered how good it could be, how good it had been so the reality of the new relationship felt, wellâ€¦. new and put a fresh panic in even the most seasoned vets eyes. We were old timers, so why did we have to put up with the business of being green again? This question dogged me for many a hundred kilometer, but eventually I found solace in the silence of an empty early morning trail and realized that being a beginner was OK, healthy in fact. Some of the newness was great and some of it was rough but the two balanced each other out. I had already identified and festered over the negatives, but the positives seeped into me like thick morning dew into my non-waterproof sneakers, slowly but with a powerful impact. To be a beginner was to be alive to the present. If this Camino was going to treat me like all the other newbies, then it was also going to hold my attention, smack me around a bit and show me what was happening right now for her and for those of us on her trail. 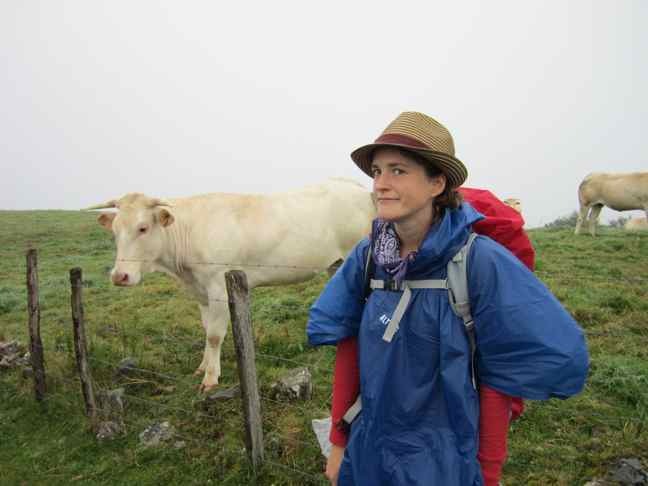 I had eaten, breathed, dreamed and chronicled the Camino for so many years that I wanted to be with my old friend again, but my old friend was still alive and changing, facing new challenges to her integrity and bringing aboard new strengths. If I could be OK with feeling new, then she could use my help in coping with all the newness. After that morning alone with the Camino, I felt I was still fumbling, but I wasnâ€™t as lost. I was plugged back into the current challenges of a spiritual trail, even if I forgot to wear my hat and let my nose get burnt, or spilled my new fangled water bottle all down my leg. I was still learning, there was time to figure it all out. This year saw a dramatic uptick in divine light pouring into the planet. This means the Earth must ground this high vibration energy as must all humanity. Itâ€™s good news for all of us as this light is part of our collective spiritual evolution, but it also brings us challenges as we try to align our vibrational systems with this new, more evolved energy while letting go of slower vibrations that impede the grounding of this new light. The gift of Flowers is that they know how to ground these higher vibrations in form and are happy to impart this wisdom via their Flower Essences. Each of us must rise to the challenge and become a more evolved version of ourselves, and Flowers stand ready to help us. This season, the Angels and Elementals of Green Hope Farm continued to help us create Flower Essences that will support us all to ground these new vibrations in our physical bodies. Many of these Flower Essences come from Flowers that have long stalks reaching to the sky. This Flower signature reflects the planetary process at work of receiving this light from higher realms and grounding the vibrational wisdom from these realms into form. This plant signature also echoes the wisdom held by these Flowers to be both in this world but also part of the coming age, a complicated dance of being fully here while attuning to what we must bring into manifestation. Because of the pressing need to tune up our systems, the Elementals also asked us to focus on making Flower Essences from Flowers native to the Cape Floral Kingdom of South Africa. Plants originate from six distinct geographical regions or Floral Kingdoms on Earth with most of these Floral Kingdoms covering vast areas of the planet. For example, the Floral Kingdom we live in here at the United States is the Boreal Kingdom which covers 42% of the Earth, including all of North America, Europe and Central Asia. In contrast, the Cape Floral Kingdom is by far the smallest Floral Kingdom comprising just .04% of earth and entirely contained within the country of South Africa. Amazingly, this tiny Cape Floral Kingdom gave birth to the greatest biodiversity of any Floral Kingdom with over 9,000 different plant species co-existing in this region with almost two thirds of them endemic i.e. originating from this Kingdom and this Kingdom alone. This Floral Kingdom represents an inexplicable evolutionary leap forward which scientists might call a mutation and which I would call the result of a previous uptick in the planetary vibration eons ago. No matter how we understand how the Cape Floral Kingdom came to hold such diversity in its flora, it is an immensely important source of wisdom for humanity right now. If we are to ground the vibrations coming to the planet, we must give birth to a new world of peaceful divine oneness in great diversity, and the Cape Floral Kingdom offers us a manifest model of this. Since conscious oneness is a term in use more frequently these days, it seems worth describing what I think this is and is not. Conscious oneness is not a group mindset in which everyone follows the lead of one person, one organization or any authority figure. Conscious oneness is a state in which we each take responsibility to seek our own inner guidance and live in authenticity from this inner guidance. Because of the divinity within us, this means that each of us will bring to the world gifts of self that neither diminish nor imperil others, but in fact, add to the light of collective humanity. One last thought. Itâ€™s hard not to notice that cleansing weather has been part of this vibrational shift for the planet. In order for these higher vibrations to prevail on Earth, old, stuck and slower energies must be removed from land, air and water. This cleansing is going to happen through weather if we donâ€™t aid the Elementals in this work. 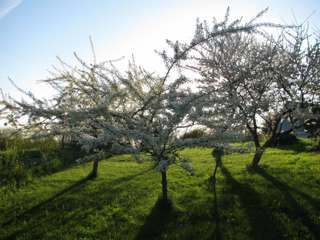 Therefore, in addition to seeking Flower Essences to help you make this vibrational leap, I also encourage you to work with the Elementals to benignly cleanse your environment so that extreme cleansing mechanisms like floods, earthquakes, drought and fire are not necessary for the land you live on or in places you hold dear. A cleansing process can be found in the current Guide on page 240 AND on the blog right before this one. Below is a brief description of the new Flower Essences followed by a more indepth description with a photo. Later in September we will have one more Essence to offer when we make this year’s Venus Garden mix on the Autumnal Equinox. Cape Fuschia â€œMoonrakerâ€- Keeping calm, cool, collected and focused on our spiritual tasks at hand no matter the disruptions we face. Cape Hyacinth- Help to receive the blueprints and divine inspiration for this coming age. Graham Thomas Rose– Support to express our unique creative voice in a time when individuals not organizations will bring the paradigm shifts necessary for us all. Kirengeshoma- Finding and keeping to our true path. Lemon Verbena- We have to dump a lot of informational mind idea rubbish to evolve but this one helps us retrieve the ancient wisdom that still serves us. Linden- Help, particularly for those born before 1978, to rewire our circuit boards so we can contain the new energies. Margaret Merrill Rose– Support to have serenity prevail in our electrical systems as well as in our emotional response to external circumstances. Nicotiana Mutabilis- A model for authentic self expression while simultaneously understanding our underlying interconnection. 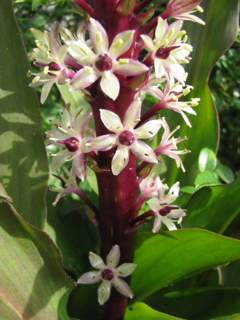 Pineapple Lily- Helps us birth a dramatically new and healed paradigm for cooperative co-creation both within our individual lives and collectively. Pink Magnolia- Supports our cellular awakening and rebirth in alignment with the new higher energies while also helping us feel safe and comforted amidst all the change. 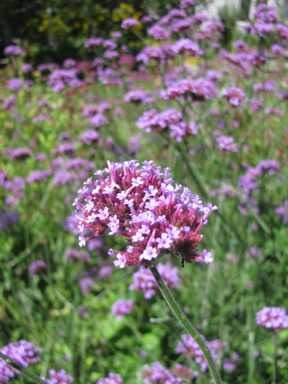 Verbena Bonariensis- Support to do the healing work to find appropriate boundaries in formerly enmeshed relationships or circumstances and then maintain this loving but appropriately detached place. This soft creamy yellow tubular Flower comes from the Cape Floral Kingdom of South Africa. Itâ€™s Flower Essence offers wisdom about zeroing in on what matters and what we must do even in extremely distracting circumstances. In particular, it supports us to keep focused on our spiritual tasks at hand, especially during times of tumult or disruptive circumstances that might otherwise overwhelm or splinter our focus in many directions. This is an extremely wise Flower Essence offering information about how to stay cool, calm and collected in times of stress or when many different forces press us to fly off in different directions. I AM clarity of thought, word and deed. This is the largest, most striking Hyacinth I know. 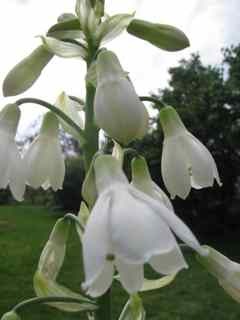 In our garden, its white bell shaped blossoms rise up on stalks almost five feet tall. Cape Hyacinth helps us bring to consciousness all that we need to remember about ourselves and our individual and collective destiny in this coming age. It helps us access dreams of import and otherwise connect with the realms that hold the visions of this coming new age. This Flower from the Cape Floral Kingdom of South Africa has been waiting to serve humankind since the birth of Flowers. I AM the blueprint of the coming age. 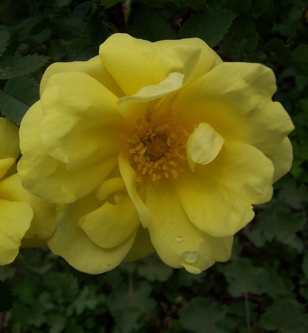 This deep yellow Rose helps us mentor our creative selves in a grounded way. It helps us do what is actually needed to get our creative projects moving, and it also helps us truly understand the value of our creative voice and our creative endeavors. This Rose Flower Essence serves the current paradigm shift by helping us grasp that this is a grass roots new age in which the solutions that are so needed will come not from organizations or self appointed leaders but from each of us who awake to and express our creative knowing. I AM the full manifestation of my creative self. 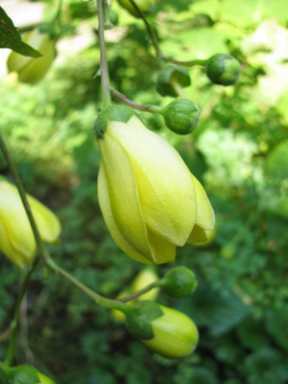 Native to eastern Asia, Kirengeshoma bears pendulous soft yellow blossoms on long arching stems. There is something extremely gentle but also intent about this Flower, and this is reflected in its Flower Essence which offers wisdom about following our true course gently yet firmly. This time calls us to continually distinguish between right and true action versus unproductive or harmful choices. It calls us to abandon the mind ideas of the prevailing culture to live from our own inner knowing. This is not a casual process but requires much earnest inner work as well as a willingness to take full responsibility for our choices. 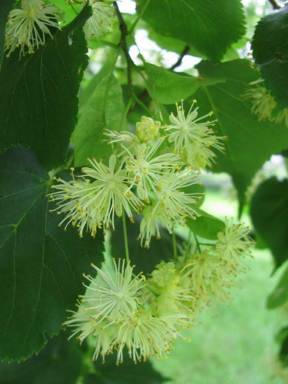 Kirengeshoma Flower Essence supports us in this process of discernment as well as holding true to our truth in our decisionmaking. I AM on my true path. We have to dump a lot of informational mind idea rubbish to evolve, but this one helps us retrieve the ancient wisdom that still serves us. It helps us remember things we thought were long forgotten from our memory including past life wisdom as well as wisdom held by the collective unconscious. Lemon Verbena also has a sorting function and helps us bring forward useful information, not random trivia. It is a particular friend to herbalists and those who work with nature. I AM the remembrance of things past. This ancient fragrant Flowering tree has often been planted in allees that lead majestically from one place to another. This ushering us through thresholds is also a gift of its Flower Essence. Linden offers timeless wisdom about vibrational adaptation. As our electrical systems work to match the rising planetary vibration, Linden helps us build an evolved circuit board to absorb this vibration while also staying grounded. No words can do justice to this pillar of light or the profound way it can help us move through this time with greater ease and grace. The Angels have explained to me that those of us born before 1978 have outdated circuit boards and will have to do different work to hold the new energies in our electrical systems than those born more recently. They say this is a particularly good Essence for those of us born before 1978. I AM full manifestation of the light. 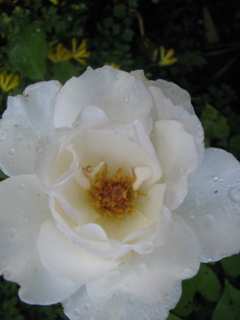 A pearly white Rose whose Flower Essence helps us remain serene during complex overheated energetic situations. It is good in particular for fiery situations or times when we feel â€œwiredâ€ with systems racing. This Rose helps us find and maintain our calm amidst any crisis or overheated drama. It is also a great support when we must help others find a necessary calm after a collective panic. This coming era will be an age of spirituality in which we will experience our divine oneness while simultaneously living from a more authentic and grounded sense of self. Given our prevailing cultural model of cutthroat personal interest at the expense of others, this era can sound like a fairy tale. Yet the rising vibration of the planet is going to require us to live this different model, and Flowers offer a living vibrational example for how we can make this transition. 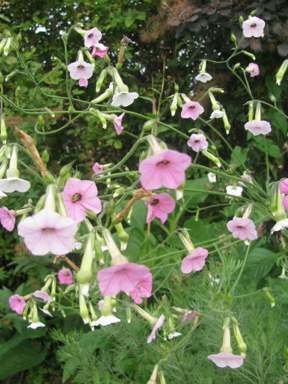 Nicotiana Mutabilis Flower Essence is a Flower that offers a particularly helpful vibration for realizing this new paradigm. It ushers us to a new expansive model for co-existence that encourages self actualization in the closest of close proximity to others. Recently discovered in the Rio Grande do Sul region of southern Brazil, this Nicotianaâ€™s Flower signature reveals itâ€™s unique strengths. Usually Flowers from a single plant are the same color, and when the colors are different, it is usually because the Flower opens one color and fades to another. Nicotiana Mutabilis is the only Flower I can think of that has many different color blossoms on the same stem all open and blossoming simultaneously in a range of colors from white to pink to magenta. 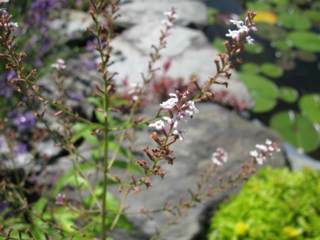 These Flowers with their tall nodding stems of many colored blossoms have an otherworldly quality of fairy like magic, yet they are very much a grounded and real presence in the garden. 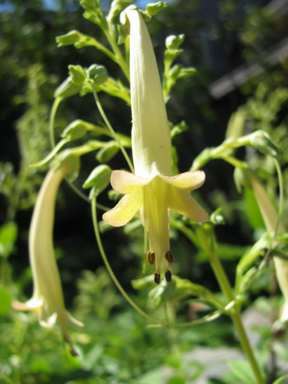 As a Flower Essence, Nicotiana Mutabilis is going to help us grasp the dynamic of self actualization within the context of connection, encouraging us to know the truth that oneness does not mean losing our unique qualities as a soul but in fact, means being this more so in a world of actualized spiritual harmony and interrelationship. I AM manifest oneness. 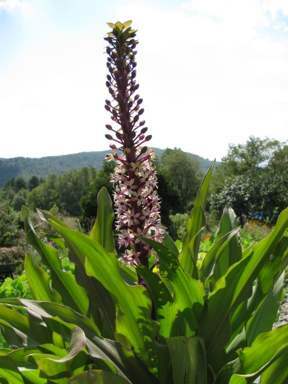 Native to the Cape Floral Kingdom of South Africa, this dramatic Flower rises up rather unexpectedly from loose wavy leaves into a majestic stalk of purple buds opening to green and white fragrant blossoms. Each Flower stalk is set off by a jaunty splash of leaves above the Flowers, giving the Flower a slight resemblance to a pineapple. This Flower has a very long history as an herbal remedy. As a Flower Essence it offers much wisdom about birthing new healing paradigms in even the most unlikely circumstances and even when a situation may feel anemic and unable to support new life. It will be useful for relationships or any structure that needs a new infusion of energy and new direction in order to grow creatively. Of course, it will help us with this big mutation project on our hands; to go from illusion bound warring tribes to co-creators of a new Earth. The Green Hope friend who called my attention to this Flower found it helped her transform a romantic partnership that had gone in tragically destructive and seemingly unsalvageable directions into dramatically new healed terrain. It is tremendously powerful in its ability to birth the new no matter the circumstances, and therefore is a much needed Flower Essence at this time of transition for humanity. I AM the new beyond the domain of all that has gone before. This was the first new Flower Essence made in the Green Hope gardens in the spring of 2011. It helps us to integrate and assimilate into the cells of our physical bodies all the light and higher vibrations flooding into the planet right now. 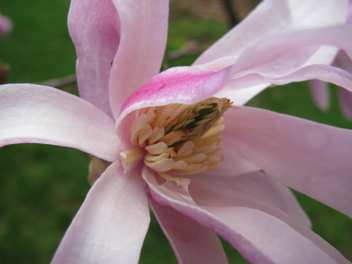 With a vibration both protective as well as deeply comforting, Pink Magnolia helps us towards a cellular awakening and rebirth experience that is both individual and collective. As a Green Hope friend in Sweden said, â€When I first tried it, it felt like, â€œI have come homeâ€ in some way.â€ A long time healer friend reports, â€œPink Magnolia is a remarkable Essence! Thank you for the gift of its deep heart opening. Itâ€™s a timely Essence thatâ€™s gone into every blend since it arrived.â€ Other Green Hope friends have reported numerous healing synchronicities after working with Pink Magnolia, another gift of this sparkling friend. The pink of the blossoms is very key to this Essence.Â Almost everyone reporting back as we introduce this Essence has a story about the color pink in his or her life or things of pink significance occurring. I AM comfort in times of change. This is a dramatic yet sweet lavender Flower composed in delicate clusters on very tall stalks. In the garden the Flower both harmonizes with all other Flowers but also feels set apart. Its Flower Essence works on this strength to be both connected yet appropriately detached. 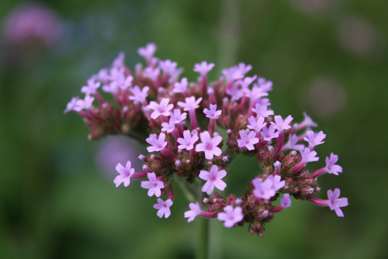 As an Essence, Verbena Bonariensis supports us to experience equanimity and good boundaries, even after significant enmeshment. It helps us to find a space of forgiveness for all involved in any drama without getting pulled back into any inappropriate dynamic. It helps us stay in a place of loving detachment, helping us define a landscape of evolving harmony different than the terrain that went before. This is incredibly important right now because we can sometimes do the work to heal and move on, then fall back into the same dynamic out of a sense of guilt or over-responsibility. This one helps us let go for good. I AM forgiveness with detachment. The Elementals have asked me to post this information again fyi. Please email me at [email protected] with any questions. If you can do this every day, this is of maximum benefit to land you live and work on, but even occasional cleansing will be a great help! It should not take more than a few minutes. I like to sit quietly while doing this but if need be, do it on the fly. The cleansing will be done when you ask for it, no matter how or when you ask. 1. THE OVER LIGHTING DEVA of the piece of land you want to clean. This being from the Angelic kingdom holds the divine plan for this piece of land. They work with the Deva of the land. These are the beings who bring your land into actual form and then hold it there so we can live in a world of form. You can also ask for the Elementals of earth, air, water, fire and ether to support you as well as the Elementals of the land you are clearing. There may or may not be any connected depending on the piece of land. You do not need to list all the names above to get help! After you call in some variation of this group, ask them to CLEANSE, CLEAR, REBALANCE AND ILLUMINATE the land you are clearing. You can ask them to clear the EMOTIONAL, MENTAL, PHYSICAL AND ETHERIC BODIES of the land of everything that is not pure divinity. Ask that any negativity be released and transmuted through a CHRISTED GRID. This is not a religious thing. This is just a way to describe a cleansing filter that purifies the energies so that they do not come back to the land again. You can visualize all the negativity being removed from the land both below and above ground or you DONâ€™T HAVE TO VISUALIZE anything. The land will still be cleansed because you have asked to have it done. If you want, after the cleansing, you can ask that the land that has been cleansed be filled with divine love and light, specifically that it hold this new higher vibration coming into Earth to serve our spiritual evolution right now. This fills the land that has been cleared of negativity with positive energies so that negative energies donâ€™t just rush back in to fill the void created by the clearing. When Green Hope Farm began, many people asked me, â€œWhy isnâ€™t Green Hope Farm in Vermont?â€ I had no answer for them other than, â€œBecause, for some reason, it is here, a few miles east in New Hampshire.â€ But this doesnâ€™t mean I didnâ€™t get the gist of the question. Vermont has a more â€œforging ahead into the unknown with old ideas rediscovered and new ones yet to be foundâ€ ethos than New Hampshire, and that attitude is certainly what we try to bring to our work here. New bridges are in all out futures because new circumstances are going to keep knocking on our doors no matter. We all are going to have to take from the past what worked and leave the rest on the other side of the new bridges we build right now, confident new realities await us on the other side of our new bridges. And God Bless Vermont and the example it sets for all of us, because it has been doing good bridge building for so very long. Vermont’s steep hills with farms down in the valleys have long been vulnerable to floods and other ecological disasters, often due to soil erosion caused by bringing old world methods of farming to new terrain. By acknowledging these problems Vermonters arrived at new ways to work the land. They also helped create the national environmental movement which could be said to have been born in Vermont in the hands of people including Frederick Marsh Billings. Vermont has been a leader in so many other progressive ideas as well: green technology, the locavore movement, community supported agriculture, artisan cheese, and new concepts of community living based on the tradition of Vermont town meetings. With this kind of momentum, I am confident Vermont will build good new bridges in the wake of Irene. And I donâ€™t have to just be hopeful here. Lizzy heard Governor Shumlin of Vermont on the radio talking about the problem of having the nerve center for Vermont on the flood plains of Waterbury Vermont. In acknowledging the problem comes the likelihood of solving the problem. Problems faced can then bring gifts and better bridges. But a problem can only be a gift if we acknowledge there is a problem. Our regional shopping center of many individual plazas in nearby West Lebanon, New Hampshire went through Hurricane Irene with five feet of water sweeping through its stores, because, well, the entire vast shopping area was built on a flood plain for the Connecticut River. And todayâ€™s newspaper said that almost all the stores in West Lebanon plan to rebuild right in the same place. This doesnâ€™t sound like a good idea to me or a good bridge to a sustainable future. As the muck of Irene turns to dust and blows about the sea of parking lots like a scene from the 1930â€™s dustbowl, another hurricane named Katya seems to have her eye on New England and from another storm system entirely, the weathermen tell us that we can expect 2-6 inches of rain in the next 48 hours, just the kind of rain volume that triggered all the flash floods last week in our water logged region.